Gateway National Recreation Area is an ideal location for day field trips in the New York region for many reasons. The park preserves and protects a variety of coastal depositional environments which support many biological habitats. In addition, the park has a rich history, especially in relation to coastal military fortifications, marine safety research, smuggling and piracy, and has its share of shipping and storm-related tragedies. Sandy Hook has two small museums that has a variety of exhibits and book sales displays. Each section of the park has a variety of recreational and information service sites that could be visited. Like all national parks, animals and plants are protected in Gateway NRA. Natural material should not be disturbed or removed from the park. However, because Gateway is a "national recreation area" different parts of the park are given various levels of protection status. Exceptions are made for the collection of small quantities of common shell and beach debris for educational purposes from public beach recreation sections in each park unit. Sensitive habitat areas, such as bird nesting areas and historic structures, are closed. It is highly recommended that all trips to should be coordinated with park personnel responsible for each of the park units (i.e., Fort Tilden, Sandy Hook, Floyd Bennett Field, Jamaica Bay, etc.). A shallow trench dug in the lower, middle, and upper beach or in back bay tidal flats will expose a variety of sedimentary features. BE SURE TO FILL IN THE HOLES! Also, DO NOT dig in the back beach dune areas or in areas where plants are actively growing. You may be arrested! Walk around until you find natural exposures of dune stratification. Collect dune sand on drifts along trails or roads. Examine the sand using standard sieves. Use hand lenses to examine sand from different parts of the beach for sorting, roundness, and heavy mineral content. Bring a magnet and paper to evaluate iron content. Compare the composition of the sand and gravel on the beach. Why are they different? Examine gravel materials on the beach. Collect about a bucket of gravel from wrackline gravel accumulations and wash it through a wire mesh screen. Have students sort the gravel by composition. What rocks and minerals are most abundant? Why? 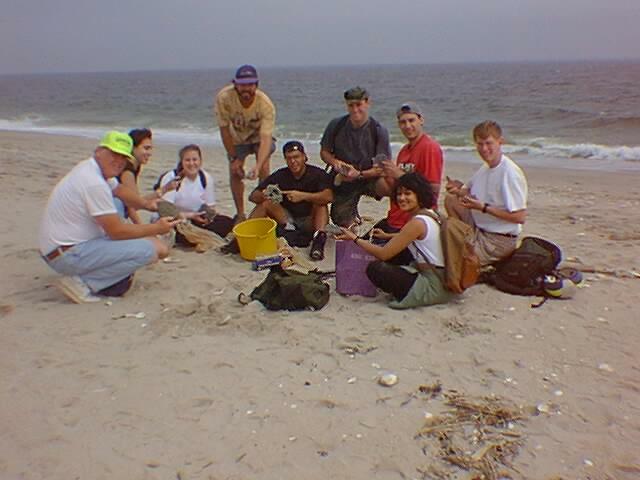 Have students walk the beach and collect hand-sized specimens of each rock-type available. Try to identify where in the region the rock material originally came from. How did it arrive on the beach? Are there any fossils in the gravel materials found? Can they "tell us" anything? What material wins the "longest distance traveled award?" Note the impact of manmade structures on the longshore transport of sand. (Nordstrom's book in the "information guide" is a useful resource for the history of man's relationship with the active coastal sedimentary environments along the New Jersey shore!) Discuss the impact of sand replenishment to the beach area near Seabright, NJ (at the cost of $15,000,000). What impact did it have on the Park? Will it affect shipping channels in the harbor? How will it affect coastal habitats in the park? How does it economically affect the area? Who benefits, who looses? How long will the sand stay on the beach? Where will it go? What are the alternatives to beach enrichment here and elsewhere? How might it be paid for by other means than tax dollars? Conduct a survey of man-made materials that wash up on the beach. What is most abundant? What is its composition, density and durability compared with natural in the environment? Are they deposited preferentially in different areas? Where does it come from, why is it here? Does past and present ocean dumping practices affect the abundance of these materials on the beach? Is there a "definitive" source for any of these materials? What impact might the offshore dumpsites have on the occurrence of these materials on area beaches? How do they move through the environment? Keep an eye open for such things as "drift seeds" and items such coconuts, pineapples and other objects that may have been transported northward on the Gulf Stream current. (Note, however, that certain religious groups sometimes leave fruit along the beach as offerings to their "gods.") Pumice on the beach may be from Caribbean volcanos! III. CHANGING SEASONS AT THE BEACH. Visit to the park at different seasons and make note of the differences. The changes in the abundance of birds, plants and wildflowers, and weather characteristics are obvious. Changes in the character of the beach are more subtle, but quite notable in photographs taken at different times. For instance, the beach profile constantly changes from storm to storm, tide to tide, and season to season. Is there a wrackline or multiple wracklines? Why is there a wrackline? What is the appearance of the back beach, berm, lower beach, runnels, cusps, offshore bars, etc? Is there a change in the abundance of gravel and shells, heavy mineral sands, flotsom, etc? The weather can be unpredictable. Plan accordingly. It is generally 10-15 degrees cooler along the shore, and can be quite windy compared to inland. Fog and mist can drench as fast as a heavy rain. Wear teashirt and shorts in warm weather. Take extra raps that you can take off and carry easily. If there is a hint of thunder or lightning, GET OFF THE BEACH! Sun tan lotion is always essential! Wear light shoes or sandals for walking. Assume that they will get filled with sand. Watch out for broken glass, medical waste, etc. Bring a small backpack for carrying things. Carry several extra plastic bags. If you bring a camera or a microscope keep it in a plastic bag to help keep out sand and/or moisture. Bring extra clothes if you PLAN to get wet. Consider school rules if taking teens to the beach. All school-age group activities must be coordinated with the park first. Bugs in the back beach areas can be treacherous during late spring and early summer. "If you don't know what it is, don't pick it up." Poison ivy is abundant and can cause problems any time of year. Learn to identify it with or without leaves. Ticks are a problem any time of year. Be sure to have student check themselves carefully, especially after walking through vegetated areas. Ask interested "friends" to assist you on your trip. Have enough help to supervise students "of any age." Bring field guides for shells, birds, flowers, etc. Bring binoculars for bird watching. If packing lunch, bring a garbage bag. Plan time for a picnic or visit an area restaurant on the way home. Make restroom facilities available to students before starting activities. Be aware of, and obey, all signs. Park only in designated parking spots. Don't park in loose sand. Don't leave valuables in the car. Take them with you! Tell students not to get separated, to be prompt, and where to go should the become separated. Stragglers ruin trips. Take a few garbage bags along to pick up beach trash, especially plastic that can endanger wildlife. Everyone will appreciate you! If you aren't sure, ask permission first!